Mayline is one of the most reputable office furniture manufacturers in the industry today. Their extensive selection of desks, chairs, and professional office tables, are the most respected throughout the furniture community. Todays article highlights the top office table styles by Mayline for home and business use. Conference tables are a must for many workplaces. They provide a place for coworkers to meet to discuss and decide things unique to their business needs. Mayline recognizes the importance of quality conference tables for the modern workplace and have worked to offer their best products in some of the finest collections they offer such as Sorrento, Aberdeen, Stella, and Napoli. Each table is individually designed to meet different needs, yet each one is a work of art. Often available in several wood finishing options, all you'll need to add is some stylish conference room guest chairs and a few presentation boards to make your conference room a masterpiece! Many homes and offices have recognized the importance of keeping event tables around. Regular events help keep neighbors, friends, and even coworkers on friendly terms so that they can work together. The great corporate event tables offered by Mayline are stylish and of high quality, making them perfect for holiday parties, get-togethers, office events, picnics, birthdays, and especially sports events. 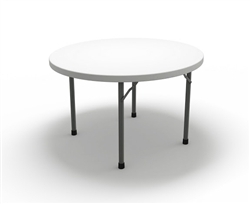 Mayline's event tables are available in both both circular and rectangular tabletop configurations in different sizes, and can easily be folded away for storage. They are a must for anyone who likes to keep things fresh and exciting by organizing events for everyone to enjoy! Many people underestimate the usefulness of bistro style gathering tables, but in fact, they are one of the most versatile items on the market today. 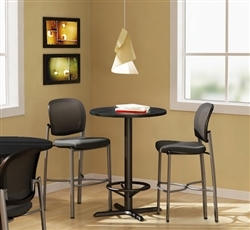 These little tables are a necessity in any cafe or coffee shop, but they are also great in break rooms, cafeterias, restaurants, in lounges, or as waiting room furniture. Their small size makes them wonderful additions for apartment dwellers, and the bistro tables by Mayline are so well built and fashionably designed they can fit in just about anywhere! They typically seat between two and four people and are offered with round, recatangular, square, or even peanut-shaped tabletops. All you'll need is a few tall stools or some chairs and your ready to chow down, surf the web, or crack open a good book wherever you feel like! 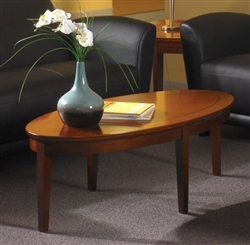 Today, one can find reception tables and waiting rooms just about anywhere, from dentists' offices, to doctor's offices, hospitals, hotels, restaurants, and businesses big and small. Fortunately, Mayline's wide selection of quality reception tables features products of all shapes, sizes, colors, and designs to match any decor! Products like the ones from the Mayline Sorrento collection are dashing and built to last, usually manufactured out of high end hardwood. They make gorgeous additions to any set of lounge furniture and would look fantastic in any home, office, fancy restaurant, or waiting room! The addition of training furniture to workplaces is a trend that is sweeping the nation. 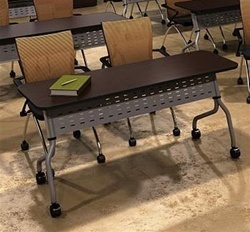 The affordable and functional furniture is not just great for training new recruits, but its also brilliant for places like libraries, schools, recreational organizations, cafeterias, and much more. The training tables by Mayline meet all the standards required for training room furniture such as functionality, "nesting" capabilities (meaning they can fold against one another for easy storage), mobility or stationary options, and best of all, stylishness! The best news is that there are training room chairs that do all the same things! Mayline offers a wide selection of training tables from their collections, T mate, Encounter, Meeting Plus, Flip N Go, and Sync for your convenience so that you are sure to find something that will match your decor!